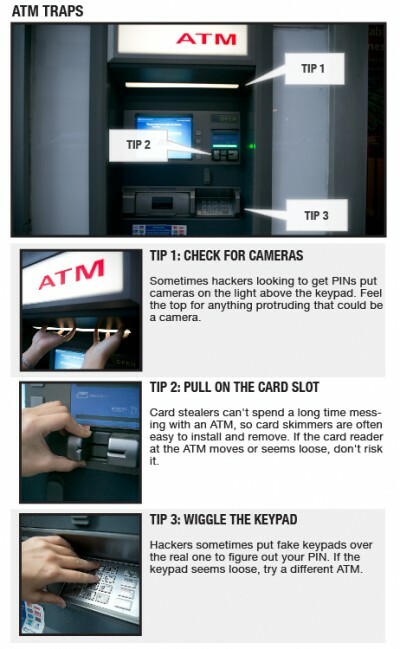 We’ve talked a lot over the years about being on the lookout for ATM skimmers — devices placed on or in ATMs with the goal of stealing users’ credit/debit card numbers and PINs — but here is a handy step-by-step guide on exactly what to look for when you want to make sure your transaction isn’t being recorded. Look for cameras anywhere that would have a view of the keypad. These cameras are installed by scammers so they can tape you entering your PIN. Covering the keypad with your other hand while you enter your PIN will help defeat most cameras. The actual skimming device is usually placed directly over an ATM’s actual card slot, but since scammers don’t often have hours to properly install skimmers, the illegal device may come off in your hands with just a few gentle tugs. Since placing your hand over the keypad will defeat most PIN-stealing cameras, some jerks are placing their own keypads over the ATM’s as a way of recording users’ PINs. So give that keypad a wiggle or a jiggle (your choice) and if it feels loose, find another ATM.